Last winter I spotted a cool granny square scarf in a magazine. It had a designer price tag so of course there was no way I could afford it. At the time I was just getting into crocheting and so I decided to make my own! It turned out pretty good and is mega warm. I’m actually quite glad that winter is coming on as it gives me a chance to wear it again! When I was making the scarf I accidentally made too many squares. Obviously I need to work on my counting skills! As you may have realised by now I hate letting things go to waste, so I finally came up with a way of using up that extra square. I turned it into the focal point of a new bag! 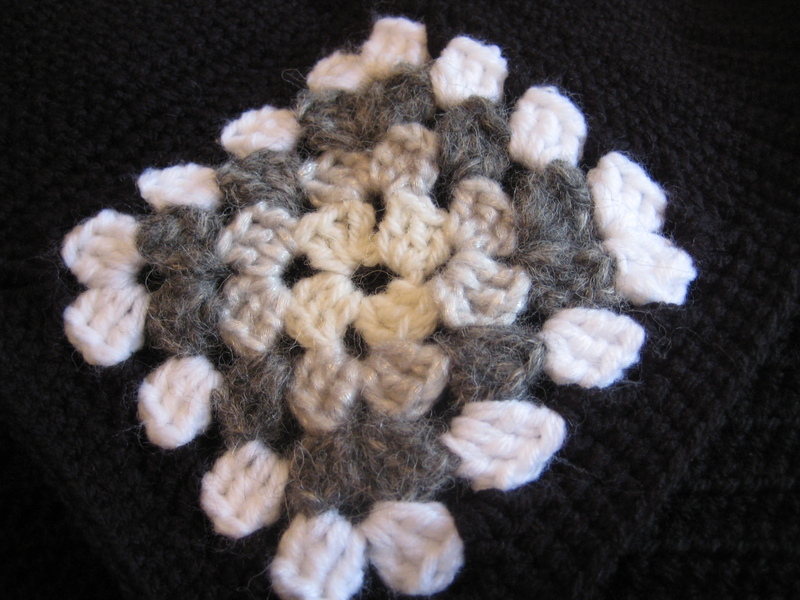 You will need to make a square of your choice- I used this simple one from Ravelry, but any square of your choice will work. Mine ended up being around 6” square with 26 stitches to a side. 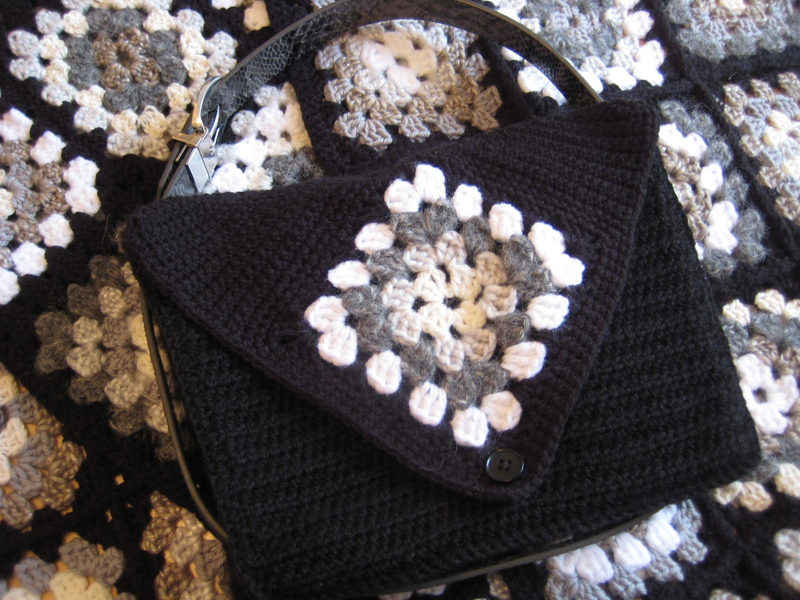 The crocheted part of the bag is made from 3 pieces- a front, gusset, and the flap and back. 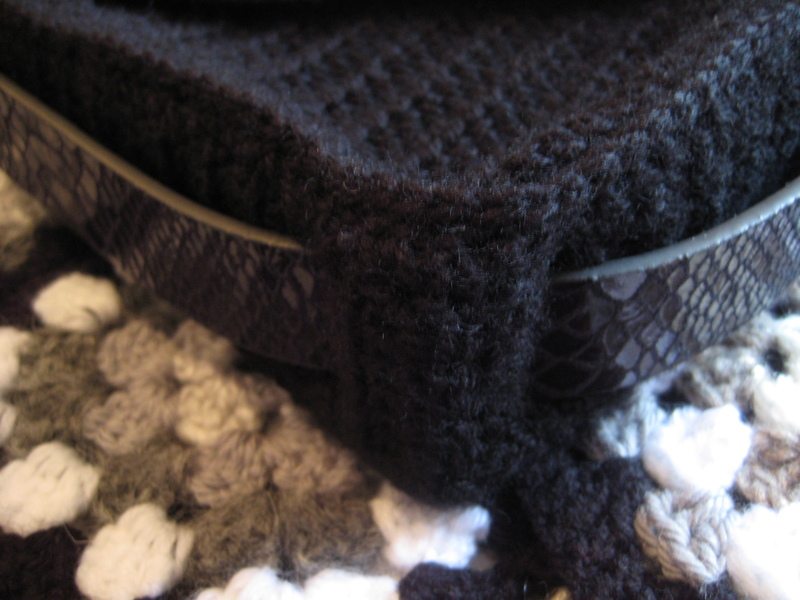 I used a belt to make the handle but you may wish to crochet a handle instead. I recommend lining this bag and adding a cardboard base to help keep the shape. If you crochet a handle this will need lining too so that it doesn’t stretch out. I used a size 5mm hook and leftover yarn which matched the hook size. The flap is made by adding triangular shapes to either side of your square so that the square forms the point of the flap. Join your yarn to a corner stitch of your square. Repeat rows 1-2 until 12 sts remain (for my square this was 14 rows total). Repeat row 15 four times (until 2 sts remain). Join the yarn at the same stitch where you started the first triangle shape. Repeat rows 1 to 20, this time working down the other side of the square. 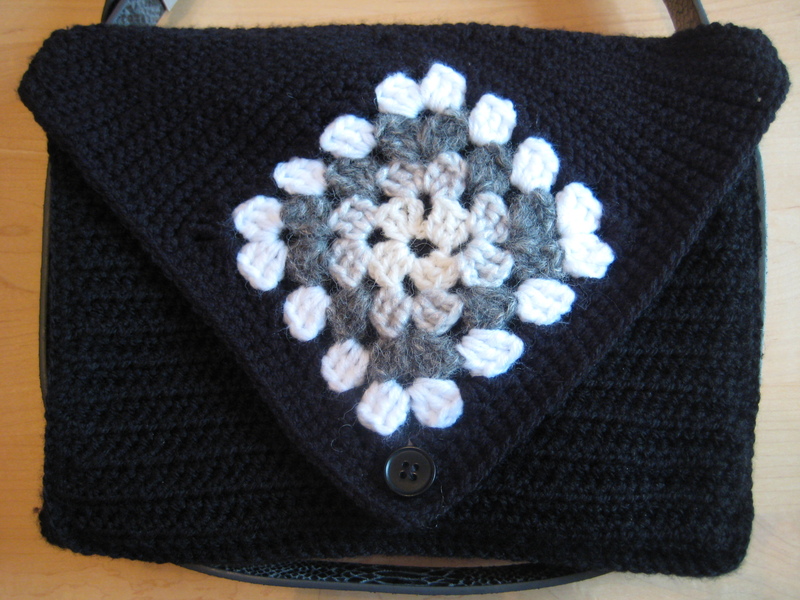 At the end of row 20, do not fasten of, chain 1 and turn the work to start crocheting along the long side of the flap to make the back of the bag. Row 1: hdc (as evenly as you can) into the end stitch of each row across. Check that this looks even before you continue. Count the number of hdc’s you have made. Ch1 and turn. Row 2: hdc in each st to end. Ch1, turn. Repeat row 2 until the back is the desired length plus the width of the gusset. Ch1, turn work and sc in the side of each row up the side of the back panel and around the flap and down the other side, putting 2 scs in each corner st and 3 scs in the flap point corner. Fasten off. Chain the number of stitches you counted when making the back plus one. Row 1: hdc into the 2nd chain from the hook and then hdc into each chain till the end. Ch1, turn. Repeat row 2 until the front is the desired length. Ch1, turn and sc into each row up the side. Fasten off. Join the yarn on the other side and sc down this side so both sides are even. Measure your belt width and adjust the width of the gusset and belt holes below if you belt is wider or narrower. You can check whether it fits after row 3. My belt was 1.25”. Row 2: hdc in 1st st, chain 5, hdc in last st, ch1, turn. Repeat row 4 until the strip is 1 inch shorter than the height of the bag. Repeat row 2-3 to make a hole for the belt handle. Repeat row 4 until the strip measures 1 inch into the base. Repeat row 2-3 to make another hole for the belt handle. Continue with row 4 until 1 inch from the next corner. Repeat the making the corner belt loops step. Continue repeating row 4 until the gusset measures 2 rows from the end. Finish with a final row 2 and row 3 to form the last belt hole. I counted up the number of stitches down each side of the front and back pieces. Then I sc’d the same number of stitches into the sides of the gusset to make the stitching together easier and to make sure it is even. However this is optional, you can just sc the pieces together directly. I suggest you pin the gusset around the front and back to make sure everything lines up right. To stitch together the crocheted pieces, sc the sides together all around the front and back with right sides facing outwards. Weave in all ends. I made a lining and added some pockets for mobile phone etc. I also covered a stiff piece of cardboard with the same fabric and put this into the base before I stitched in the lining. This prevents the belt handle from pulling the bag out of shape. I really like this blog on how to stitch in a lining if you need any help with this! If you have made a crocheted handle make sure you line this too to prevent stretching. 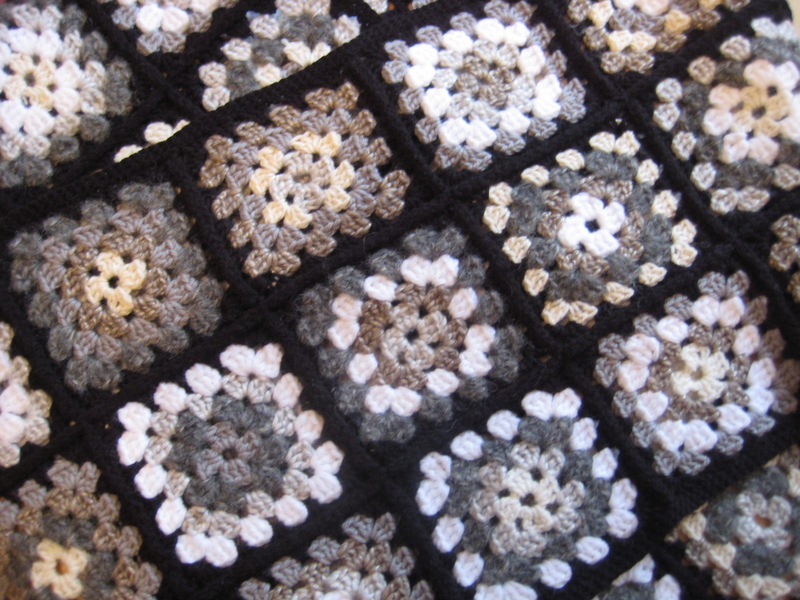 If desired you can add a button (using one of the holes in the granny square as a button hole) to the front to close the flap. Writing patterns is still a new thing for me so please let me know how I am doing and if there are any mistakes! Nice Pattern Do we have the permisson to sell what we make .